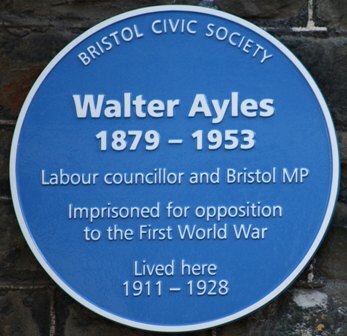 On 17th April 1916, Walter Ayles, a city councillor was arrested for distributing a leaflet criticising conscription for the First World War. He served 61 days in prison and was then conscripted but applied for conscientious objector status. He was refused, court-martialled and served 112 days in prison with hard labour. In later life he went on to became a member of parliament. Exactly 100 years later a blue plaque was unveiled at his home – 12 Station Road, Ashley Down – to honour his moral courage. Bristol Radical History Group organised a programme for the event with poetry readings, a singer and a choir. Around 120 people attended the event – respectful and celebratory – and all in bright sunshine.